Paris Mushrooms (Champignons de Paris) - are they just another example of fake news? We'd been hearing rumors of a Paris Mushrooms for several years now but only recently took the time to check out this elusive mushroom. And, what do you suppose we discovered? Well, Paris Mushrooms originated as the fruits of dark Lutetian limestone quarries positioned under the streets of Paris where farmers had realized that the catacombs allowed year round growing conditions favorable for mushrooms. By 1880 more than 300 farmers tended the underground fungal fields, producing an annual harvest of 1,000 tons. 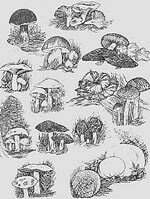 In the early 1900's more than 2,000 tons of mushroom were being harvested. However, times changed. One source, Atlas Obscura, writes that as plans were made for Paris’s underground metro system, the demise of the Paris mushroom was already underway. "Although the metro tunnels were to be built above the catacombs, the quarries in which the farmers worked had fallen into disrepair" and were being abandoned. Today, only a handful of operations exits in the region, and it appears that none continues to be located underneath the City of Lights. But, don't fret. 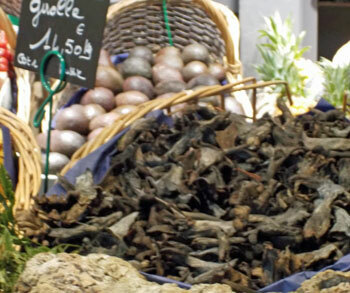 Paris Mushrooms can still be found in France, most frequently in restaurants which emphasize locally grown produce and in specialty shops, where they are marketed as having a superior flavor, thanks to their unusual growing environment. I found myself reading The Fly-Truffler twice, first for the sheer beauty of the prose and the sweet, haunting sadness of the story, and second for the art of fly-truffling. My first reading came after a rich and savory dinner. The Fly-Truffler was like a soft and creamy French Brie denoting a finale to that luxurious meal. Read in the descending light of a warm summer evening, it evoked images that enchanted and mesmerized. It was like the richest of desserts that lingered long after the plate had been emptied. It was like sipping Benedictine, single cask, oak aged, created in Normandy in the north of France, warm and wonderful, followed by an ice water back. an inviting place to read The Fly-Truffler. As good fortune would have it, 2017 has turned out to be our year for casual cruising: first, up the Columbia River from Astoria, OR, to Stevenson, WA, on the American Steamboat Line's American Express, and most recently in France from Paris North to the D-Day Beaches of Normandy on the Vantage Cruise Line's River Venture. Our European journey started in the lovely town of Conflans at the confluence of the Oise and Seine Rivers. With our river boat docked on the right bank of the Seine alongside a host of barges (some of which had picturesquely been converted to homes, while another became a museum and yet another developed into the Je Sers boat church and soup kitchen), we spent our afternoon strolling the streets and enjoyed visiting a variety of flower, cheese, meat and bread shops. We were especially captivated by one of them, La Fromagerie D'Honorine, where the owner graciously pointed out her truffle cheeses and Charcuterie plate items, including Maison Ader duck and mushroom pâtés. You're probably not surprised to learn that we exited the shop some time later with an armload of intriguing items, including a country style pork pâté with Boletus edulis and Armagnac which morphed into a much-appreciated midnight snack on slices of French bread (what else?) 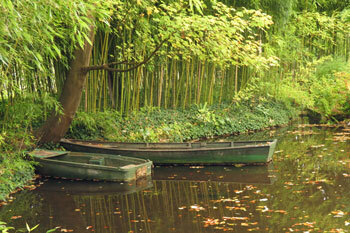 while sipping glasses of Normandy's Calvados apple brandy. 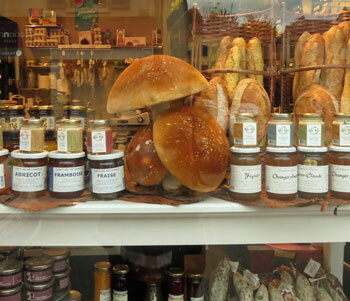 display of velvety mushrooms, sausages and pâtés! Being avid mushroomers can lead us into some unexpected places, and bestow delicious rewards upon us at the same time! 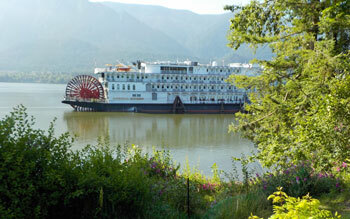 Such was the case when we signed up to cruise the Columbia River on the American Empress. One bite of the appetizer that was served on our first night of the cruise, and we were in a state of culinary ecstasy. Flaky layers of buttered phyllo dough filled with savory mushrooms and baked to a golden brown will do that for us! By the next morning we were asking Chef Lemeul McCall if the cruise line would share the recipe so that we could in turn share it with our readers. Within no time at all, Chef McCall was handing us the preparation sheet - many thanks for your generosity! Our cruise offered a great mushroom appetizer!